Eugene, Oregon is located in the PDT (Pacific Day Time) time zone, UTC/GMT -7 hours during Daylight Saving Time and UTC/GMT -8 hours during Standard Time. The sunrise is at 06:34 and the sunset at 19:49 for the moment of the end of August 2018. The length of the day is 13 hours 15 minutes. The time in Greenwich, London is 8 hours ahead of Eugene, Oregon. Eugene, as well as the rest of the Willamette Valley, lies in the Marine West Coast climate zone, with specific Mediterranean characteristics that include dry, warm summers and cold, wet winters. Spring and Fall are relatively wet in that area with quite extensive rainfalls. Snowfall takes place during the winter; however, it rarely accumulates in large amounts, about 12.4 centimeters per season. The record snowfall level was filed on January 25-29, 1969 when it has reached 106 centimeters. 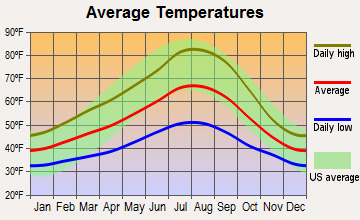 July and August are considered as the hottest months of the year with the mean temperature ranging from 19.3 to 19.4 °C. There are only 16 days per year when the temperature is reaching 32 °C. December is considered as the coldest month of the year with the mean temperature of 4.3 °C. There is 53 night per year when the temperature is low or below freezing and 2.7 days when the temperature is not exceeding the freezing mark. The average temperature in Eugene reaches about 11.4 °C and the average level of precipitation of 1.170 millimeters, therefore, the Eugene climate is slightly colder and wetter than in Portland. While being a bit above the sea level, Eugene has a more continental climate that is less affected by the maritime air blows coming from the Pacific Ocean via the Columbia River. The lowest temperature was recorded on August 9, 1981, when the temperature has reached -23 °C. The highest temperature was recorded on December 8, 2013, when the temperature has reached 42 °C. The cold daily maximum was filed on December 13, 1919, when the temperature has reached - 7 °C. The warm daily maximum, in turn, was recorded on July 22, 2006, when the temperature has reached 22 °C. Compared to nearby Portland, Eugene is a bit cooler; therefore, annual minimum in Eugene is about 10.6°C, while in Portland it is 14.4°C. Winter and high summer temperatures are usually quite similar in both cities, that might be connected with the Portland's urban heat island that raises nighttime temperatures.